Much of the debate surrounding current U.S. policy in Egypt revolves around vague notions of America's interests in the region. On one side lies the principle that the U.S. must live by its rules — to cease aid following a coup — to demonstrate to Egyptians the morality of a free society and the rule of law. Similarly, the U.S. must not risk being held in contempt by Egyptians for its association with actions of the military, which many deem to be ruthless and authoritarian. 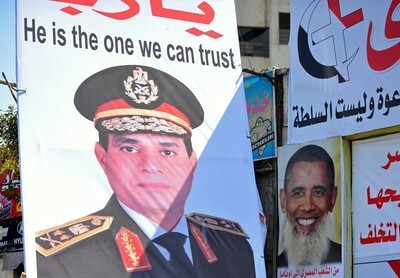 A picture taken July 29, 2013 shows posters on a street in Cairo of Egypt's army chief General Abdel Fattah al-Sisi and U.S. President Barack Obama with a beard and bearing a slogan referring to the belief by some Egyptians that the U.S. supports the Muslim Brotherhood. (Photo credit: FAYEZ NURELDINE/AFP/Getty Images). The better case for supporting the Egyptian military and current leader Gen. Abdel al-Sisi, references keeping the Suez Canal open, ensuring that the Camp David Accords between Egypt and Israel continue to be upheld, maintaining continued good relations with pro-Western neighbors, and keeping the Sinai Peninsula free from terrorist control. President Obama has masterfully defined the threat we face from those using the banner of Islam as limited to Al Qaeda and its close affiliates. Specifically, he has tapered our enemy to "terrorists" or those who use violence against us. If no violence, no problem. Yet violence, or the Violent Jihad, is just one level upon which our enemy is attacking us. There is another level, the International Institutional Jihad, upon which international organizations such as the United Nations, The Organization of Islamic Cooperation (which essentially controls the UN General Assembly), the Arab League among others, advance elements of global Islamization upon which their constituent Islamic nations can agree. Is it any wonder that the UN cannot agree upon a definition of "terrorism" when, to its Islamic base, the word essentially excuses the killing of non-Muslims? Of recent relevance is the attempt to globally criminalize speech which is critical of Islam or its Prophet Mohammad. As witnessed with the great tyrannies of history, once critical speech can be stopped, totalitarian control becomes much easier to install. (As an aside, it is particularly worrisome that former Secretary of State Hillary Clinton co-sponsored UN Resolution 16/18 and its subsequent materials, which put us on the doorstep of such ultimate criminalization). The third and most insidious level of threat is the Civilization Jihad, named by the Muslim Brotherhood itself. The Brotherhood's 1991 Explanatory Memorandum and other materials outline its program for infiltrating American society at all levels in order to destroy it from the inside. Recognizing that this is a long-term undertaking, the Brotherhood has efficiently established deep relationships within our government, our educational institutions, law enforcement, financial institutions along with most of the nation's Muslim community groups so that it is postured to feed a congruent message and strategy throughout the country. A sister document, "Phases of the World Underground Movement," outlines the series of phases the Brotherhood is to take over time to accomplish its goal. And through its many "organizations and the organizations of [their]friends" including ISNA, MSA (The Muslim Students Associations), and the predecessor to CAIR (the Council on American Islamic Relations) and many more, the Civilization Jihad is being carried out in every pocket of our culture in plain sight. This is a strategy built to use our freedoms to destroy our freedoms, quietly, peaceably, and over time employing what Dr. Martin Luther King called "the tranquilizing drug of gradualism." The objective is best expressed by the Memorandum's own words: The Brotherhood "must understand that their work in America is a kind of grand Jihad in eliminating and destroying the Western civilization from within and 'sabotaging' its miserable house by their hands and the hands of the believers so that it is eliminated and God's religion (Islam) is made victorious over all other religions." The fact that the Brotherhood tends to renounce and avoid violence has given it great cover in the past. Yet in 2010, when Al Qaeda leader (and former Brother) Ayman al-Zawahiri attacked the Brotherhood for relying too much on the dream of political process, the Brotherhood's leader, Mohammad Badie, responded by announcing it was time to "wage Jihad" against America. Badie was recently caught and imprisoned by the Egyptian military. Additionally, the military's assault on the Brotherhood has allowed the Brotherhood to show its true colors. America sleeps while Christians in Egypt are treated by the Brotherhood much as Jews were during the 1930s in Germany. The Brotherhood has a rich history with Nazi Germany and subsequent Nazi formulations. Yet Obama, the Christian, does nothing. And where is Samantha Power, Obama's newly appointed UN Ambassador who authored the "Responsibility to Protect" doctrine used to justify actions to protect supposedly aggrieved Muslims in Libya. Egyptian Christians face far worse oppression from the Brotherhood and, as her doctrine requires, many states in the region such as Saudi Arabia and the UAE support the Egyptian military. Not a peep from Obama or Power. America must realize that its interests lie precisely in the destruction of the Brotherhood. Along with the regime of the Islamic Republic of Iran, the Brotherhood is our nation's most menacing enemy at this point in time. Until our foreign policy simplifies so as to focus upon the Brotherhood as such, we will continue the suicidal road of delusion. Some insist that we have a greater interest in respecting sovereignty and standing up for democracy. Since the Brotherhood was democratically elected, we must support that process even if we need to hold our noses. First, America's values lie with a constitutional republic built around solid institutions that lend it support and credibility. Mere democratic elections were not sufficient for our Founding Fathers as simple democracy is too subject to the quickly changing whims of the electorate. Egypt, much like Gaza, did not have such a support system making any analogy with America inappropriate. More importantly, our support for democracy and freedom abroad requires that those populations learn to be responsible for the results of their elections. Electing Hamas did not mean that we should then alter our interests to welcome that which would otherwise clearly be unwelcome. To the contrary, the only way those in Gaza will learn the value of their vote is for the U.S., Israel, and others to treat Hamas, and similarly the Brotherhood, for exactly who they are. The next time, if there is to be a next time, the electorate will think twice. Just because the Brotherhood was elected to power does not mean that America should forfeit its interests. Rather, we are in a war with the Brotherhood not because we choose to be but because it has declared it so. This is also a war to the end; there is no long term peaceful solution. Accordingly, America's primary effort should be to win; to destroy the Brotherhood just as Obama's stated policy seeks to destroy Al Qaeda. War weary as we might be, this is precisely the time to push forward, not to retreat. Demonstrated for over a thousand years, aggressive Islam only ceases to press onward when defeated; all else is temporary respite. Unfortunately, what is thought by many and said by few, is that Obama is, if nothing else, extremely sympathetic to the Brotherhood. There are many with deep Brotherhood connections who have infiltrated the administration and other arms of our government. And to recognize this, one need not pay any attention to those "crazy" and "silly" conspiratorial charges that the family of Hillary Clinton's right hand woman, Huma Abedin, has been deeply entrenched in the Brotherhood and related entities, that John Brennan (formerly in charge, perhaps, of the presumed Benghazi gun-running operation and currently the CIA director known for espousing the wonders of Jihad) is a converted Muslim, or that Saudis financed Barack Obama's education and so on. And it certainly in no way suggests that Obama is in any way Muslim or a Muslim Brother. Yet, any objective review of Obama's actions to date would conclude that Obama is properly described as the "Muslim Uncle" or even the "Muslim Godfather" (the Mafia had its roots in Islamic controlled Sicily) as he consistently promotes, protects, and oversees the Brotherhood's interests "over there." From forcing Mubarak from power to supporting Turkey's Islamist transformation to ousting Qaddafi (timed to allow the Brotherhood to gain substantial access to power in Libya), to making immediate pleas to cease the ouster of Mohammed Morsi. While in circumstances unrelated to the Brotherhood, he is seen declining to assert much of a policy, facilitating Brotherhood positioning for a post-Assad Syria, endlessly positioning Israel as aggressor, and making his early "Apology Tour" speech specifically to Brotherhood leaders and so on. Obama's allegiance has been made clear to those who have the courage to look. Accordingly, despite our president's contrary desires, our policy toward Egypt need not be complex — support the Egyptian military as it is ultimately the best way to protect America from its grave enemy, the Muslim Brotherhood. As we support the breaking of the Brotherhood over there, it will become easier to design an effective policy to protect us here. Oddly, not so long ago, a local non-extremist Muslim military fighting an Islamist/terrorist/extremist organization in a Muslim land would have been the Left's preferred means to battle Muslim "extremism." Perhaps we will have to wait until we have cleansed our own government of Brotherhood infiltration before we can properly protect our interests abroad. Unfortunately, the times call for what Dr. King also called "the fierce urgency of now." Bill Siegel is the author of The Control Factor: Our Struggle to See the True Threat published by Hamilton Press.